Warlords brought a lot of changes to Druids in general. While Feral got its fair share it wasn’t hit as hard as the other specs. Perhaps one should be thankful for small favors? Either way, Feral can still hold its own in Raids and PvE. For a list of all the new stuff, see our Warlords of Draenor Druids post. This page focuses on the Feral Cat form as a damage machine in a PvE (raiding) environment. For PvP or leveling see the links just below. 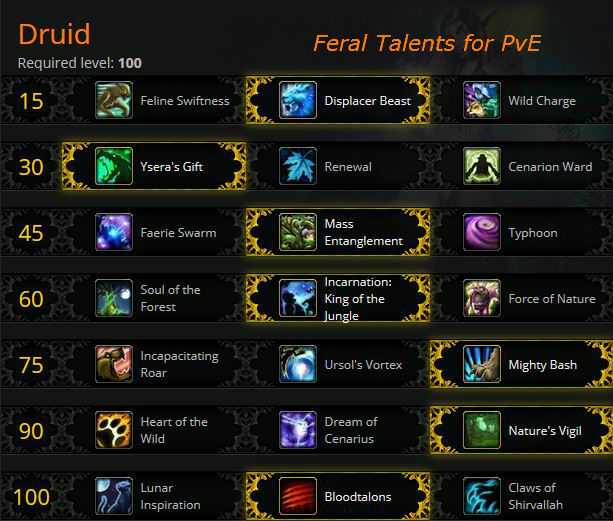 This Feral Cat Druid guide is primarily intended for use in PvE and Raiding at level 100. However, the principals will still apply during the leveling process. If you’re looking for more advice on leveling your Druid, check out our Druid Leveling Guide. There are times when you might want to change talents to better suit a particular fight or situation. Fortunately, changing is easy. Click the new talent in your talent pane, spend one Tome of the Clear Mind per talent, click “learn” and you’re good. Feline Swiftness provides a passive speed increase that happens to stack with the default speed bonus of Cat Form. Take this if you feel the need for a bit of extra speed that doesn’t require (yet another) button. Displacer Beast is basically a Blink + Dash combo. If you find this (burst movement) more useful the a constant movement increase, then by all means take it. It’ll also easily get you past certain mechanics, such as energy walls, puddles of goop, etc. Wild Charge lets us leap behind a target, making it useful for any fight where you might have difficulty maneuvering behind your enemy and for swift transitions from one target to another. If you need to off-tank then the Bear Charge will be useful. It also has half the cooldown of Displacer Beast. If a fight requires frequent long distance running, take Feline Swiftness instead. Ysera’s Gift is a pretty nice self-heal that can heal allies on occasion. Great for leveling and pretty decent in PvE where you’re looking at taking a lot of moderate to low damage, rather than kitty-crunching hits. This is the best choice for general use and it’s a passive, so one less button to deal with and you can focus on doing damage. It heals 98% over the two min that Renewal will heal 22%. Renewal is a decent heal, but at present time is inferior to Y’s gift. It’s good if your damage is being taken in the form of the occasional big hit or if you feel that a 22% heal (30% in patch 6.1) every two min is better than a HOT (Heal Over Time) doing 98% over that 2 min. Useful if you want a bit more control of your abilities. Cenarion Ward is not a good ability for us. Do not take Cenarion Ward. Bosses will scoff at all of these talents, so pick the one best suited for the trash you’ll be facing and your role in the group. Faerie Swarm is a minor buff to Faerie Fire. It slows the target for 15 seconds, which might have very occasional use. More for PvP than PvE. Mass Entanglement will be useful for any fight that requires CC and when the mobs aren’t just all piling onto the tank. For example, that patrol that just entered the area. Typhoon lets you knock targets out of the range of your attacks so you can deal less damage. Might have some occasional value, somewhere, sometime. Tanks, in particular, always love having their target(s) knocked away from them. Soul of the Forest provides more energy regeneration from your finishing moves. It’s a nice, steady DPS increase. Incarnation has great value for being able to enter stealth mid-fight and allows your Rake and Shred to act as if you were stealthed. The added damage outweighs the energy return of Soul of the Forest. As with the tier 3 talents none of these will bother the bosses, they’re only for trash. Incapacitating Roar is a decent ability, esp if you’re in a crowd. Disoriented enemies do no damage. Only lasts a brief time. It will interrupt caster in that trash group. Ursol’s Vortex is more useful for PvP than PvE, for you. Might be good for a tank, though. Mighty Bash is a decent talent, as stuns are almost always nice (except when they don’t work.) Take this if an encounter demands that you have a stun available. The picks here really depend on your role in the group. If you’re providing assistance other than pure DPS then they’re nice, for example: the occasional off-tanking or healing. Heart of the Wild greatly improves your non-feral abilities for 45 seconds. Nice pick if you’re out of form often enough (going Bear, Caster, etc.) to justify it. You’ll get 45 seconds of being a half-decent off-tank, assistant healer, etc. Dream of Cenarius improves your Healing Touch and Rejuvenation by 20%, casting either of those spells to heal your ally also heals you. So how often are you casting heals? If you’re just DPS then skip this one. Nature’s Vigil is a powerful DPS cooldown. All the damaging and healing abilities you use also heal a nearby ally. This is a nice cooldown to have in high damage phases. You don’t have to change a thing about your rotation and the group gets some added healing. Do you have need of an added DOT? Cast the occasional heal? Or is your role more utility than pure DPS? Lunar Inspiration: Moonfire is now usable while in Cat form, adds 1 combo point, and costs 30 energy. Adds a ranged attack (a DOT) to your arsenal. If that’s useful then take this talent. This talent is easier to deal with than BloodTalons, though it does less overall damage. If you’re new to Feral then this is a good talent to use until you have more experience. Bloodtalons: Casting Healing Touch causes your next two melee abilities to deal 30% additional damage. Heal yourself (for 150% total effect) or someone else, then execute your burst on the enemy. Cast healing tough right before the fight then get those two strikes in to start things. Between this and Ysera’s Gift your health should always be in a good place. Claws of Shirvallah: shapeshift into a creature half man and half cat. This alternate Cat Form allows the use of all non-damaging Druid spells while shapeshifted, and increases Versatility by 5% (which is a decent damage add.) You don’t have to shift forms to cast things like Cyclone or other utility spells. Depending on your role this may well be the pick, but it’s basically not helpful to your overall DPS. More of a PvP talent. A number of your glyphs are automatically learned, so if you can find them from the Auction House or an available scribe try checking your glyph list, they may already be there. Note that certain pair or trios of glyphs are exclusive, such as the glyphs of ninth life and of cat form. You cannot use both. More or less in order if importance. Most likely you will always be using three of the first four listed. The others are shown for their occasional interest. Required: Glyph of Cat form or Glyph of Ninth Life. These two are exclusive, so pick your favorite. Cat form increases the effectiveness of healing down to you while Ninth Life decreases damage. For most cases Cat Form will be the preferred glyph, but if your healers are just a bit weak then Ninth Life might be a better pick. Glyph of Savage Roar – when Prowling you can a free 5pt Savage Roar buff whenever you use Rake or Shred. Especially handy is you’re using the Incarnation: King of the Jungle talent. Glyph of Stampeding Roar is an option if your raid requires the speed boost. Glyph of Dash reduces the cooldown of Dash by 60 seconds, improving your mobility. Savagery – Your Savage Roar is now always passive, always on, but is 10% less effective. Depending on your game and your setup this may be a good way to go. Glyph of Ferocious Bite causes you to be passively healed for a small amount for each 10 Energy you use with your Ferocious Bite. Glyph of Survival Instincts reduces the cooldown of Survival Instincts by 40 seconds, but also reduces its duration by 50%. You get a 3 second SI ever 90 seconds instead of 6 seconds every 3 min. Is that useful to your game? Glyph of Maim – if you use Maim a lot. Glyph of Rebirth – ever rez your team? This lets them pop up with 100% health. Glyph of the Master Shapeshifter – if you stance dance and cast a lot of mana spells, then consider this one. These glyphs offer, at most, small changes in utility. Otherwise they’re just cosmetic. Glyph of Grace for those times when you feel like cliff jumping. Glyph of the Predator might have some occasional use if you use your tracking ability in raids. Glyph of the Cheetah – if you don’t want to go stag. Warlords introduced two new stats, Versatility and Multistrike, and killed a few others: Hit, Expertise, Resilience, PvP Power and also the ability to reforge stats. You can also find tertiary stats, such as Leech, Speed, and Avoidance, but these appear randomly on gear and cannot be gemmed or enchanted, so won’t be mentioned further other than to say they nice when you can get them. Gems and Enchants no longer have Agility (or any primary stat,) so your focus will be on the secondary stats, such as Crit. Weapon: Use the highest level 2-handed Agility weapon that you can get. Primary: Agility >> anything else, but you’ll only find it on gear, not enhancements. Priorities change depending on the exact talents you pick, your gear, etc. Crit is always good, Mastery is good (#1) against multiple targets. Gearing up for Crit and Multistrike is the best general pick, especially since the important targets tend to be singles. Agility is your Attack Power. Get more whenever you can. Crit gives you a chance at 200% effect strikes or heals. Multistrike gives you a chance at a second and third hit/heal at 30% effect. Multistrikes can crit and can proc effects, when appropriate. Versatility is a add to your damage, your heals, and your damage reduction. Neither of the latter add to your DPS, but might be nice from a survival perspective. Mastery improves your bleeds, which can add up if you’re spreading them around. Haste isn’t so hot unless you’re specced into the Lunar Inspiration (tier 7) talent, then it’s better. If you’re fighting groups then it’s on a par with Crit. Also see the videos, below. Keep in mind that your #1 priority is always to damage the opposition, unless you group really needs you to fill a larger role of damage and support. Ideally you will always want to build 5 Combo Points and then spend them on a Finishing Strike, such as Ferocious Bite or Rip. For a variety of reasons gaining those 5 points first may not always be possible. Once you have the 5 points then you will be unable to gain more. Spend them immediately. You should both try to never let your energy drop to zero or to let it stay at full. In the first case you’re left without the ability to use an ability, in the latter you’re not attacking and so are doing less damage. “Pooling energy” means to let your energy rise to near full, enough to do a couple of abilities. Keeping 5 Combo Points “at the ready” and/or full energy is a waste of potential damage. You won’t need to worry about mana, since you won’t be casting very many spells. Some of your attacks will add a bleed to your opponent. You want to keep these bleeds up 100% of the time. Remember that any stuns/slows have no effect on bosses. Some attacks also will hit harder if your opponent is already bleeding, so always do the bleed first. Rake – Bleeds for 15 seconds, stuns if used from stealth. The glyph adds 8 yards to the range, making Rake much easier to land. A perk doubles the damage if used from stealth. Shred does 20% more to bleeders. If stealthed it does 35% more and also has a doubled crit chance. (Those two damage increases stack.) It also slows the enemy. Swipe – hits all nearby opponents, does 20% more if they’re bleeding. Thrash – strike all within 8 yards and add a bleed to each. Generally you will not be using Thrash, since it does not build Combo Points, unless you have a lot of targets. If you have the Lunar Inspiration talent then you will want to keep that up on the enemy at all times, just like your bleeds. Generates 1 combo point. Rip – Finishing strike, more CPs = more damage. About the most efficient way to do damage. You want to keep this bleed up at all times. Ferocious Bite Best one shot damage ability that you have. Try to hit this with at least 50 energy pooled and all 5 CPs, for the most damage. Refreshes your rip if the target is 25% or less. Crit chance is doubled Vs bleeding targets. For low health targets you can use 1 CP, low energy Bites to refresh Rip. The glyph adds a small heal to the bite. Savage Roar – keep this up at all times. You get an automatic 5 pt SR if you rake or shred from stealth and you have the Glyph of Savage Roar. Maim – You will not be using this much, unless against some trash that really needs to be stunned. Each additional CP gives more damage and more duration to the stun. The damage isn’t really the important part, the stun is. Tiger’s Fury should be used every time it’s available, meaning every 30 seconds, making certain to use it when low enough on energy that you won’t be wasting any of the 60 points gained from activating it. Try to refresh your bleed effects while Tiger’s Fury is active to have them benefit from the damage increase. Berserk reduces the cost of your abilities by 50% for 20 seconds (15 without your perk. ) 3 min cooldown. Incarnation: King of the Jungle is particularly important to use near the beginning of encounters and should otherwise be used whenever you need to enter stealth in combat and for the burst potential. Nature’s Vigil on cooldown or in high damage phases. It won’t change your rotation at all and will add a bit of healing to the group. If you’re using the Bloodtalons talent then you should cast Healing Touch now. Take your Agility potion before entering combat: Draenic Agility Potion. Then take it again during the fight. Note: Any DOT or Bleed can be refreshed with about 30% of it’s time remaining and have the remaining time added onto the new DOT/Bleed. Refreshing it before the 30% point does not do this. Aim to refresh things right before they expire. Using your combo points you should keep Savage Roar applied at all times, preferably using it when you have 5 Combo Points. When Savage Roar is active your primary focus should be on applying and maintaining Rip on the target with 5 combo points. When the target is below 25% health switch to using Ferocious Bite as it will now refresh the duration of your Rip on your target, allowing you to deal extra damage with Ferocious Bite simultaneous to refreshing Rip‘s bleed effect. If the target is 25% or less then use Ferocious Bite, which will refresh your Rip. If Rip and Savage Roar do not need to be refreshed then use Ferocious Bite instead. If facing only a couple targets, you can simply repeat your single target rotation on both enemies, but when facing 3 or more opponents switch to instead maintaining the bleed effect of Thrash on all targets and otherwise using Swipe as your primary damaging attack. Rake, Moonfire (if you have the talent,) and Thrash your opponents. Maintain Rip on as many as you can. Ferocious Bite only if the targets are short lived. Try to have 50 energy and 5 CPs. If it’s the boss and his unimportant buddies that you’re fighting (in one group) then you can just concentrate on the boss, if you prefer. In Warlords gem sockets are actually few and far between. They have a (small) random chance to appear on Raid gear, there are no meta gems or sockets, there are no socket bonuses, and all sockets that do appear are “prismatic,” which means that they will take any available gem. The gems are all prismatic, meaning they fit into any socket. None have Int, they all have secondary stats (Mastery, etc.) There are no Meta sockets or gems. If you are interested in gemming any gear under item level 600. If you’re finding your gemming, repairs, alt funding, etc. to be too expensive then then see our gold tips. When enchanting your gear you should follow the priorities above, that is: Agility >>> everything else. Warlords killed off all profession bonuses. You no longer get, for example, two extra gem sockets for taking Blacksmithing, no more crit bonus for Skinning, etc. As a tradeoff, perhaps, Warlords skills are far easier to level than previously. Blacksmithing Very little here for you, other than ilevel 630 weapons, and the bits to both reroll stats on the items and to upgrade them. You can also make keys so you don’t have to talk to that Rogue to open any boxes you may find. Engineering will let you create a number of useful items, such as rockets, shields, a stealth device, Nitro Boosts, a repair bot, etc. These mostly cannot be used in raids, but that can be used elsewhere, such as World events or in Highmaul Coliseum. Inscription Glyphs, some trinkets, caster weapons, fortune & Darkmoon cards, and more. You can also make an ilevel 630 Agility staff and the items to reroll stats and upgrade the thing. Alchemy Chemistry is fun, unfortunately you can’t make acids or bombs. You can make flasks and potions to boost stats and cause other interesting effects. You can also make a very nice DPS trinket: Draenic Philosopher’s Stone, which requires Alchemy 500. This item is upgradable in 6.1. Leatherworking will let you make entry level armor for raids (ilevel 640.) You can also make the items to reroll the stats and also to upgrade the items to 665, at a cost far exceeding that of the original piece. You can also make Drums of Fury for a Heroism type buff (25% Haste for 40 sec.) Note that you can also use LW to fill out pieces that just haven’t dropped for you in the raid(s) and the reroll and upgrade those items. Archeology will let you pick up ilevel 620 items, usable at 91, which are bind on account. Here‘s the list of possible finds. Before Cataclysm the choice of race for a Druid was a “difficult” one: Tauren or Night Elf? Now, there are four races. Cataclysm allowed the Worgen and Trolls to become Druids. Mists of Pandaria made no changes to races or racial abilities and there are no Pandaren Druids. Warlords removed all racials dealing with Hit or Expertise. A few of these were replaced with new abilities. No new Druid races were introduced, so you’re still unable to race change to a Gnome Druid or much of anything else. War Stomp stuns nearby opponents. Very useful as often as it comes up. 2% greater effect from all crits, damage or heals. Berserking increases attack (and casting) speed. XP increased Vs beasts, all 5 million of them, which is nice while leveling, but not much use in the raid. 2% dodge is a nice ability for bear tanks and PvP, but you have little use for it. 2% faster movement than everyone else. +1% crit by day turns into +1% Haste by night. All food buffs last one hour. Any Agility bonuses also add to the food and chemical bonuses. The first section covers talents, glyphs, etc. The rotation section starts at about 11:30. Leveling your Feral or another alt? Another 100 levels to go? Want to save yourself many days of in-game time and wandering about, looking for the best way to go? The solution is Zygor’s Guide. 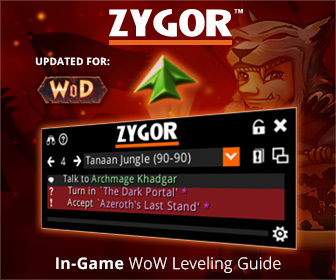 Zygor’s automates the whole leveling path, automatically updating as you complete tasks and quests, and is like having an expert helping you every step of the way. Pick your starting point, regardless of your level, and the guide automatically updates and advances as you complete quests, sets a waypoint arrow automatically, and includes all the important quest info. You’ll never again wonder about where to go or what to do. You can focus on the tasks and tearing things to pieces and Zygor will show you everything you need to know to maximize your leveling speed.